Petition to spread the truth, not propaganda. All people in the world have the right to be informed in a truthful and accurate way. But many people have to deal with propaganda, even people in the USA. Students and others face the propaganda machine of China, without knowing it. The way it works is called brainwashing. To end this, please sign the petition >>here<<. The Tibetan Youth Congress, the largest pro independence Tibetan NGO in exile, has organized a peace march from Dharamsala to Delhi. 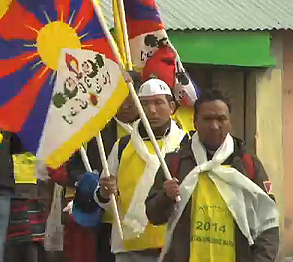 The socalled Tibetan Uprising March 2014 has started today at Dharamsala and will end in Delhi at march 10. This amounts to a total of about 600 km, which means about 20 km per day. 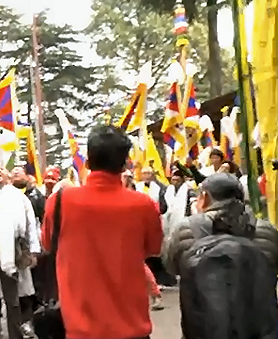 The March is initiated to raise awareness about the situation in Tibet. The president of the Tibetan Youth Congress, Tenzing Jigme, stated in a press conference that the Chinese government has enforced a series of policies to systematically destroy and stifle Tibetan culture, language, identity, and spiritual traditions. "The result is that Tibet is now facing a life-and-death struggle." He invited the chinese government to have a different look at the self-immolations and respond in a positive way on the demands. The march is dedicated to show solidarity with the Tibetans in Tibet and marks the 55th anniversary of Uprising Day. At the Tibetan Uprising Day, March 10th, Tibetan people and friends will gather at different places all over the world. It took a few days to get through online, but I finally managed to get a seat at both the lesson and public reading of the Dalai Lama. As far as I can see it's almost at the back, so I hope there are large screens so I can see enough anyway. It's a pity it's all a money thing. But long long ago I was promissed that I would be able to go when he would be in my country. I never thought the promiss would be kept, but without any real discussion a seat was booked. There are many reasons for me to be present at the event. I feel buddhist and I want to hear the lectures from as close to the source as possible. Many people have told me the Dalai Lama in person is a big inspiration. I wonder if I can sense that too. Maybe I will be too far aaway, maybe not. We'll see. I wish I could have a good talk with him. I heard him say, a while ago, that he's afraid to die. I don't experience fear of death. In fact I don't mind if I die, because maybe the next life will be better. I feel sorry for those that will be left behind and who will miss me. But to deal with mourning is part of life's tasks. I can prepare them for that as well as possible. Well, it will be nice to have a day all for myself. One of my sons will drive me there, so I'll be in time. What can I have more? Pawo Phagmo Samdup/Samdrub, a 27 year old father of two, has set himself on fire today in Dokarmo town in Tsekhog of Malho, the Tibetan area of Amdo. It's said his body has been taken away by the chinese authorities. The chinese givernment has enforced even stricter security measure in the Tsekhog area and the nearby Rebgong area, where more people have self-immolated. They have also restricted communication in Tsekhog and the areas around it. I was elated to hear that the Dalai Lama will visit The Netherlands May 10-12 2014. He will give a public lesson and reading at may 11 in Rotterdam. Tickets are available but be aware that it's best to use the advice given on the main site of the visit, as there are commercial ticketsellers who provide a kind of second hand tickets for more money. 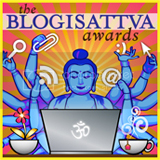 You can get more information at this site.